The war in the Pacific had just ended, when First Lieutenant Philip Miller set out from Australia on September 8, 1945 in his Army Airways Communications System B-25 en route to what is now Biak, Indonesia. 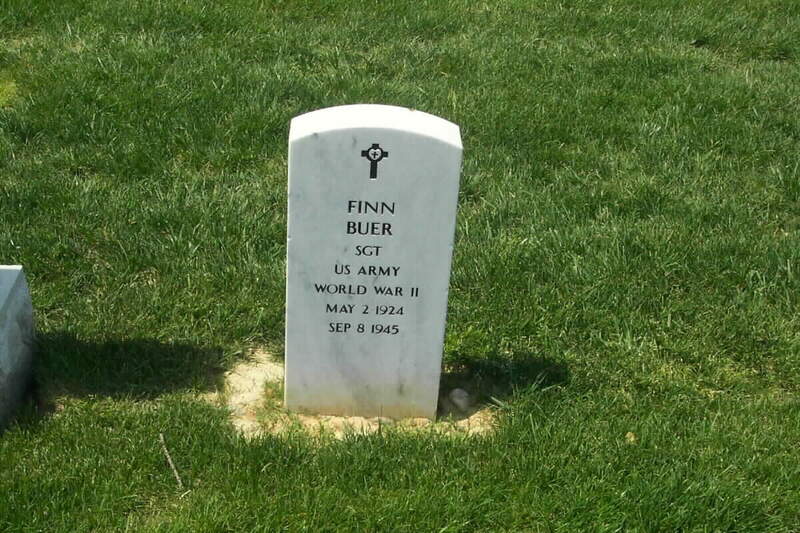 Staff Sergeant Finn Buer , a passenger on the plane, had written to his family only two days before. He told his folks to get ready to have a big party when he returned. Finn would never make it home. A helicopter pilot working for the Freeport Mining Corp. noticed aircraft wreckage on a mountaintop in Indonesia on February 5, 1996. The company notified the military attache at the American Embassy in the Indonesian capitol of Jakarta. A CILHI team recovered remains in 1999 from the site and the soldiers were identified in 2002 as crewmembers Sergeant Mathew Neary and Staff Sergeant Troy Hewett, Jr. and passengers; First Lieutenant Fred Smith, Staff Sergeants Veachel Straney, Charles Boslers and Earl Spredemann. There were two caskets for the World War II men. Buer was buried in a separate casket next to his comrades. The attendees for the second funeral were a mix of older siblings and widow, mixed with younger descendants two or three generations removed from the Pacific Theater of World War II.